Jamin LeFave is another of those artists about whom I can find little information, but whose work is fascinating. LeFave has a blog, but apparently does not have a gallery-type web site. His brief bio paragraph indicates that he is a concept and production artist working for an independent gaming company called Wahoo studios, but I don’t think any of his professional work is available on the web. Instead, LeFave’s blog focuses on his studio painting, teaching work and experiments in oil, acrylic an digital media. 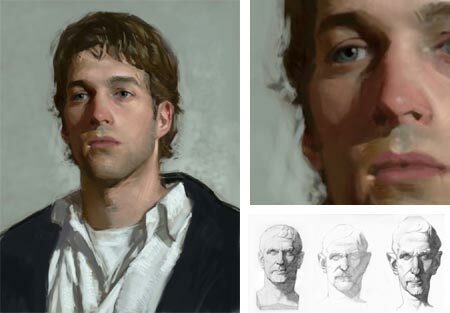 When I came across his blog I was immediately struck by a self-portrait painting in progress (above, left and detail, top right), with its combination of straightforward realism, fresh handling and solid draftsmanship. I went on to find a series of strong portrait studies, both paintings and drawings, as well as other items from his sketchbooks and classes. LeFave teaches illustration at Utah Valley State College. One of the items I found particularly fascinating is his post about a drawing exercise he does (image above, bottom right), in which he starts with a drawing from reference, in this case from a cast drawing in a Charles Bargue Drawing Course book. He follows his original drawing in a day or two with another drawing of the same image from memory only. LeFave says the he knows the memory drawing is done when he can’t remember any thing else to draw. He then uses his memory drawing for reference, and redesigns it as a looser, more exaggerated drawing with a playful exploration of the forms. He can then go back to the original for reference and add interesting details. This is an exercise I haven’t encountered before, and it sounds like a great way to build your powers of observation and explore the drawing methods of other artists. LeFave’s blog has only been established since last November, and he doesn’t add to it often, but I’m looking forward to seeing more of his work in the future. For 18 issues, Illustration Magazine has been featuring artists form the history of American illustration. Illustration is beautifully printed and full of great illustrations from the “Golden Age” through the late 20th Century. In 2005 publisher and executive editor Daniel Zimmer launched a new title, Illustration’05, in a similar format, but devoted to contemporary illustration. Both magazines are superb and of interest to any one interested in American illustration. The Illustration’05 title became Illustration’06 and Illustration’07, much to the confusion of readers and magazine dealers, and did not fare as well as it might have. I’m happy to say that Zimmer has relaunched Illustraton’0whatever as Illo., starting the numbering over at issue#1, in the same beautiful format. That format is 80 pages, focusing on four in-depth articles about contemporary American illustrators, with page after glossy, high-resolution page of beautifully reproduced artwork. The magazine is rounded out with a couple of shorter articles and reviews, features very few ads; and the ads themselves are for things like Last Gasp Publishing, Flesk Publications and shows at the Society of Illustrators, that are as much of interest to readers as the articles. Though the web site currently says that Illo. #1 is still at the printer, it is actually out and I picked up my copy yesterday. I’m fortunate to have an amazing independent book/comic store nearby in Delaware that makes a point of carrying magazines like Illustraton and Illo., but If you can’t convince a magazine dealer or bookstore near you to carry them (it’s worth a try), you can order them online directly from the publisher. Illo. is published quarterly and a four issue subscription is $40 U.S.; individual issues are $10 (cover price), postpaid. In addition you can order back issues of Illustration ’05. You can also order subscriptions and back issues of Illustration Magazine, which, like Illo., is published quarterly for $10 an issue. Issue 18 of Illustration features Allen Anderson, The Cooper Studio (part 2), Alberto Vargas, Jack Potter and others. Thumbnail previews here. 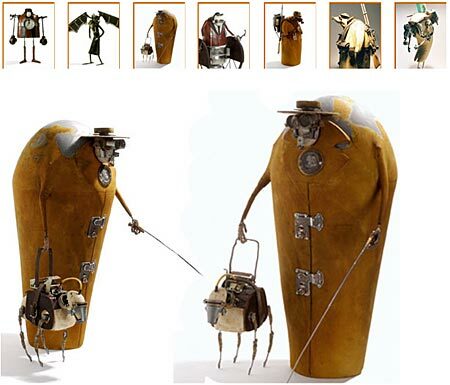 Stéphane Halleux creates sculptures of characters and objects that have a feeling of Tim Burton meets Rube Goldberg by way of 1930’s animated cartoons. His tiny-wheeled cars, junk-dealer robots, Charles Adamsish characters, mechanized chairs and enigmatic “engines” are wonderful visual fun. Their textured and weathered surfaces, strange shapes, and arrangements of odd parts are imaginative and entertaining. Halleux’s objects are appealing in a way that makes you want to pick them up, or at least be able to view them from a wide variety of angles. Though he often provides images from more than one angle, it’s unfortunate that Quicktime VR isn’t as easy as standard digital photography, it would be great to be able to rotate these images. Halleux’s web site is apparently new, as the biography section is still “coming soon”, and some other sections are also incomplete. Though there is a section of preliminary design sketches (“croquis”) for some of his pieces, there is no information on his creations in terms of materials, technique, intention or size. Hopefully, that will be added in the near future. In the mean time, we’ll have to settle for looking through his galleries of wonderfully eccentric objects. 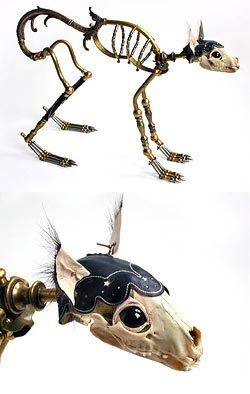 Jessica Joslin makes unusual objects that are a collision of sculpture, assemblage, jewelry and perhaps taxidermy. Seemingly displays in an unnatural history museum, Joslin’s sculptures consist of bone (real, cast or modeled), brass, sculpted and painted leather, beads, lamp fittings, wire, machine bolts, pins, feathers, pewter, glass eyes, and various antique hardware items arranged into bizarre animal forms. The result is an eerily disconcerting menagerie of “characters” to which she has assigned names like Serafina, Callisto, Ludwig, Valeria and Cosimo (at left). Joslin is quick to point out in her FAQ that when she does use real bone or animal skulls, she obtains them from the same suppliers that provide them ethically to natural history museums. She often uses casts or modeled pieces as well, and does her best to make it unclear which is which. When viewing her galleries, note that you can often click in the text area on links for detail images. Her objects vary in size from one inch tall to nearly six feet, and her site arranges them according to series done in particular years. Joslin works professionally as a commercial model maker, crating prototypes for toys (perhaps for an extra-dimensional toy company). Metamorphosis is a new book of contemporary fantastic, visionary, outsider, and magic realist art published by the beinAart International Surreal Art Collective. Founded in 2002 by Jon Beinart as the beinArt Australian Surreal Art Collective and expanded internationally in 2006, the collective has a presence in the form of a web site with galleries of work by the participating artists. The Collective is a treasure trove of fantastic art with, as Beinart puts it, a representation of both “light” and “dark” themes. The book follows suit, and from the preview pages posted in the Collective’s Forum (click on the images for larger versions), promises to be a definitive collection of contemporary artists working in this vein. If I were going to pick nits, and I’m obviously about to, I would balk at the casual misuse of the terms “Surreal” and “Surrealist”; even though I’m occasionally guilty of it myself. My point is not even that Surrealism was a specific art movement from a particular time, but that Surrealism was an art devoted to specific principles and intentions, and not just a catch-all term for art that includes bizarre imagery. I doubt that many of the artists in the “Surreal Art Collective” (or most of those contemporary artists referred to as “Surrealist”) concern themselves with automatism or the other elements of Surrealist creative process. I wouldn’t even call Ernst Fuchs, who I recognize as an important figure in fantastic painting, a Surrealist, and I doubt that he would classify himself as such. The desire to misappropriate the term is common and understandable, though; the more correct terms of fantastic art, visionary art, magic realism or fantastic realism don’t have the same zing and brand-name recognition as “Surrealism”, but they are more accurate. Now that I’ve got that out of my system (for the moment), I’ll go on to say that the new book from the beinArt Collective looks terrific and includes work from a number of artists I’ve featured previously on lines and colors, including Sergi Aparin, Brom, Andrew Gonzalez and Alex Grey. There is a full artist list here in which the artists’ names are linked to examples of their work. You can spend hours discovering amazing work in the beinArt Collective’s online galleries (as I have done on occasion), but as with much visual art, there is a great deal to be said about the appearance of high-resolution images in print, quite different from viewing the same images in low resolution on screen. Images above, from top: Alex Grey, Andrew Gonzalez, Pavel Surma, Ernst Fuchs, Carrie Anne Baade. Xiangyuan Jie is a Chinese painter, born in Hunan province, now living in Florida. He originally studied theatre set design and graduated from the Central Academy of Drama in Beijing with a BFA in that specialty, to which, in a way, he would later come full circle as a background artist for animated films. He taught for several years at Hunan University and then traveled and lectured in Europe as a visiting scholar. He eventually settled in the U.S., taught at Auburn University as a visiting professor and later studied and taught at the College of Architecture at Georgia Tech. Somehow, his background eventually led him to working with the Disney Feature Animation Studio in Florida, where he has done concept and background art for features like Mulan, Tarzan, Lilo and Stitch and Brother Bear (image above, top) and Ice Age 2. 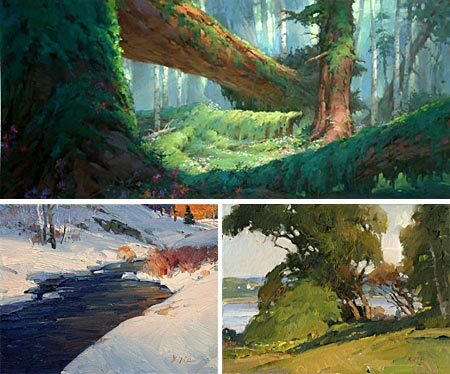 Jie is also an accomplished plein air painter, painting in a wonderfully open and colorful style informed by the early work of Impressionist inspired painters from Europe, Russia and the U.S. (images above, bottom). His web site, although it still says “coming soon” in several places, is at least partially functional and has a section for his gallery art and a section for film work, though the content of both is limited at the moment. You can find much more of his visual development work on his Visual development art for films blog, including multiple versions of backgrounds, working sketches and color keys. His work for Brother Bear, in particular, was done in a fresh, painterly style that came out of his work painting real landscapes. Jie also maintains a painting blog, Art of Xiangyuan Jie, on which he posts recent work, photos of plein air painting excursions and links to extensive web albums of his landscape paintings, portrait studies and commissioned portraits, in which you can see the influence of Sargent and perhaps Anders Zorn. There is now a book available of Jie’s landscape paintings. Ordering information can be found on his blog.